2013 was the Year Of Pie and 2014 is the Year Of Bread! It's still warm and summery here and I wanted to make up for my family missing out on the peach tarte tatin I made a couple of weekends ago, but I didn't want to make yet another tarte tatin so soon. I'll be making plenty more, don't worry about that. Then I stumbled on a recipe in a lifestyle magazine that looked pretty darned yummy, so figured I'd give it a go. It doesn't have an attribution; it's just in Real Living March 2013, page 165. Make pastry using whatever method. Chill for 2 hours. Score bottom of peaches with little crosses. Boil in water for 3 minutes and then place into iced water to cool them down. Once cool the skins should peel off. Slice the peeled peaches around the stone and place in large bowl. Add the blueberries, sugars, lemon juice, cinnamon, nutmeg and cornflour and mix to combine. Roll out half the pastry to form the base and place in pie dish, trimming excess. Place the fruit filling into the pie. The pastry base should come up slightly higher than the filling. Roll out the rest of the pastry and cut into 2cm strips. 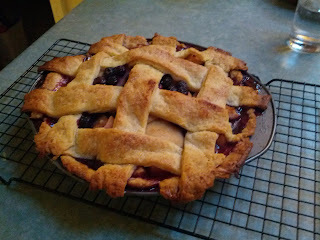 Make a lattice and place over the pie, trimming excess. Fold the edges of the base pastry over the lattice. Brush top with milk and sprinkle with a little white sugar. Bake pie for 20 minutes at 220ºC and then a further 40 minutes at 180ºC when the pic should be golden and the filling bubbling. Now, I should say right here that the pie was pretty nice as I made it, however the peaches weren't cooked, the base wasn't baked and the liquid was still very runny. The peaches weren't ripe enough. This caused two problems: firstly they didn't peel using the method above. I had to use a peeler in the end after much boiling/cooling frustration. Secondly even after baking the peach didn't soften at all. I used the peaches in their not-fully-ripe state in this recipe because the peaches I'd used in the tarte tatin were basically in the same state, so I figured it would be OK. I know otherwise now. There was way too much filling; ⅔ of the fruit filling would have sufficed. I ended up over-filling the pie and that probably contributed to the undercooking of the peach and the liquid not setting. Don't over-fill the pie. Follow the recipe. There's no blind-baking step. The first 220ºC is supposed to bake the crust, but I would blind bake next time.